The Marmalade Toque Catering. We are the event planning specialists. Call us for all your catering needs! we hope you like it as well! Air Reserve Base in Riverside, Ca. Our catering department can also assist you with a wide variety of other related services such as locations search, audio/visual equipment, florals, wedding cakes, DJ, espresso/cappuccino barista service. The catering department at The Marmalade Toque Catering would like to take this opportunity to say thank you for your interest in our excellent catering services. Our goals are to provide you and your guests with the finest catering products and services available. We are committed to exceeding all of your expectations through an uncompromising dedication to every aspect of your catering experience with heart and passion! We will exceed guest expectation in an environment that is exciting as well as cordial and hospitable. We will not run out of food. We will provide top quality products and services. We will provide an unparalleled superior experience in an environment that is cordial, hospitable and exciting. You will have a courteous and professional staff to service all of your catering needs. You will be thoroughly satisfied with our services. The Marmalade Toque Catering will expertly and professionally take care of all of your catering solutions for your private catered wedding reception, anniversary, birthday, baptism, bridal showers, baby showers and more plus private chef service in your home for that intimate dinners for two. We will come to your location and create a truly memorable and exciting catering experience. Sushi Bar Catering: The Marmalade Toque will please the palates of all of the sushi lovers out there. This set up showcases a Domo sushi chef as he prepares your favorite sushi dishes. We are now offering a Chocolate Fountain service. 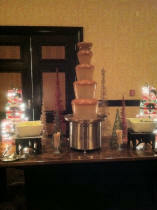 This is a commercial fountain with milk chocolate, white chocolate or caramel, plus all of your favorite accompaniments. Also available are gourmet cup cakes, chocolate fountain and sundae bars. Copyright © 2010 The Marmalade Toque Catering, LLC. All Rights Reserved.